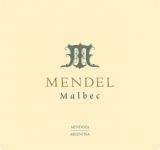 "Mendel Winery embodies the union of Roberto de la Mota - one of Argentina's most respected and experienced winemakers - with a nearly century-old Argentine family, whose sole objective is to produce wine of unquestionable, superior quality. Proprietor and longtime wine lover, Anabelle Sielecki, diligently tracked down the very best talent Argentina had to offer when seeking Mendel's winemaker, and with utmost charm and perseverance, brought Roberto de la Mota on board. Roberto, son of legendary winemaker Raul de la Mota, has an impressive winemaking record and a lifetime of winemaking education and practice. Together, they choose the best blocks from their ancient vineyards, and every artisan winemaking step is rigorously performed. Extraordinary vineyards, passionate people, experience and friendship are all blended to create these truly remarkable wines. Mendel is the first name of Anabelle's father, a man who came to Argentina with nothing and ended up a successful businessman in different industries. He was a man that loved the finest things that life had to offer, particularly wine. Anabelle proudly honors her father by seeking perfection in her and Roberto's wines."